SHREVEPORT, La. (November 15, 2017) – Blood; it’s all red but it’s not all the same. That’s why Remington College Shreveport Campus is holding a 3 Lives Blood Drive and highlighting the need for minority blood donors. Nationally, Remington College has collected more than 13,900 pints of blood through its 3 Lives Blood Drives. And since one pint of blood can save three lives, that’s enough blood to save more than 41,000 lives. While the focus of 3 Lives is to increase the number of minority blood donors, everyone is encouraged to give blood at the event. Donors must be 17 years of age or older and weigh a minimum of 110 pounds. All the blood collected will go to local hospitals and medical centers to help people in the Shreveport area. Remington College Shreveport Campus is located at 2106 Bert Kouns Industrial Loop. For more on the 3 Lives program, visit www.3Lives.com. 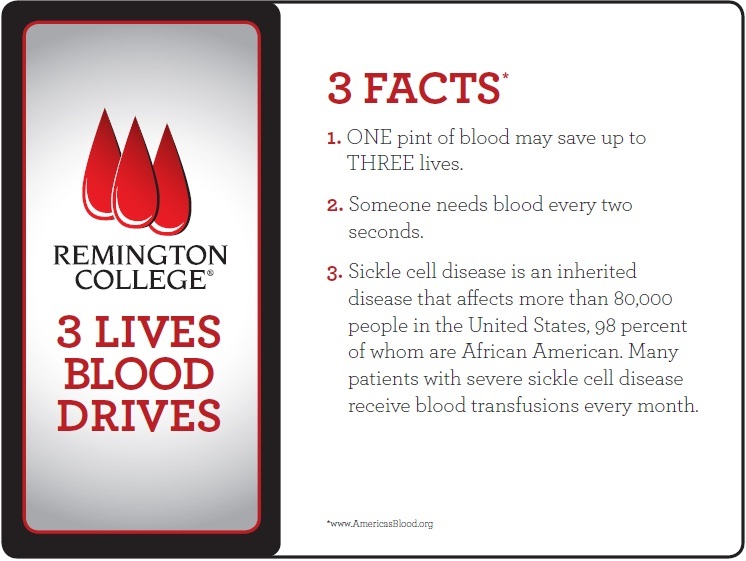 Remington College created the 3 Lives campaign to recruit new minority blood donors and raise awareness of blood disorders. Minority donors – particularly African American donors – are in high demand because they provide blood with unique antigens that are vital for patients with sickle cell disease and other blood disorders. According to the Sickle Cell Disease Association of America, more than 2.5 million people carry the sickle cell trait in the U.S. – mostly African Americans. 80,000 people in the U.S. have sickle cell disease, and 1,000 babies are born with sickle cell each year.